Welcome to kongstuffing.com, the home of anything and everything you can stuff into a kong toy (or similar) to keep your dog happy! We hope you and your dog like our recipes, please comment on them to let us know what did or didn’t work for you, or send us your own recipes to add to the site. If you’re not sure what a kong is, then read on. Otherwise please use the menu to the left to get stuffing! 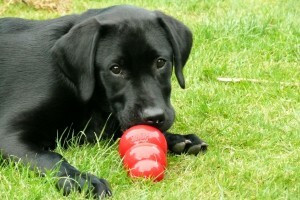 Kongs are hollow, rubber toys made by the Kong Company. They are virtually indestructible (honestly!) to dogs and are easily filled with all sorts of treats to keep them happily chewing. Kongs are available in different sizes to suit different breeds, and you can also get puppy kongs made of slightly different rubber to suit a puppy’s teeth. Kong Company also make pastes and biscuits to help fill their kongs, which you will find popping up in our recipes. But you don’t necessarily need a kong to get kong stuffing! Other manufacturers make similar toys to stuff, plus you could use something like an empty calcium bone. Check out our ‘what to stuff’ section for more information on what’s available.